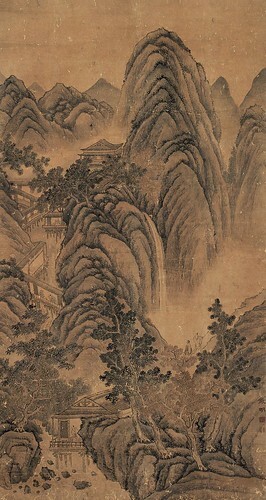 Wen Zhengming (文徵明, 1470–1559) was a leading Ming Dynasty painter, calligrapher, and scholar. Born in present-day Suzhou, he claimed to be a descendant of the Song Dynasty prime minister and patriot Wen Tianxiang (文天祥). Wen’s family was originally from Hengyang, Hunan, where his family had established itself shortly after the 10th century. Not until the time of Wen's great-grandfather, Wen Hui, a military officer, did the family move to the Suzhou area. Wen often chose painting subjects of great simplicity, like a single tree or rock. His work often brings about a feeling of strength through isolation, which often reflected his discontent with official life. Many of his works also celebrate the contexts of elite social life for which they were created. He collaborated in the design of the Humble Administrator's Garden (拙政園), generally considered one of China's four greatest gardens. 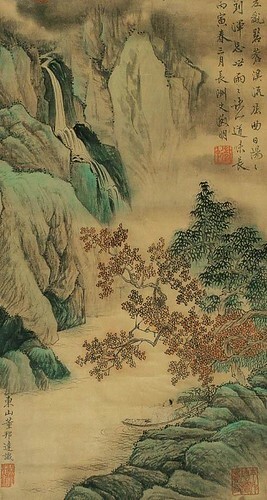 Wen Zhengming is regarded as one of “the Four Masters of Ming” (明四家), which also includes Shen Zhou (沈周), Tang Yin (唐寅), and Qiu Ying (仇英).